WEAR BLAZE ORANGE or other bright colors. This applies to you and your pet. 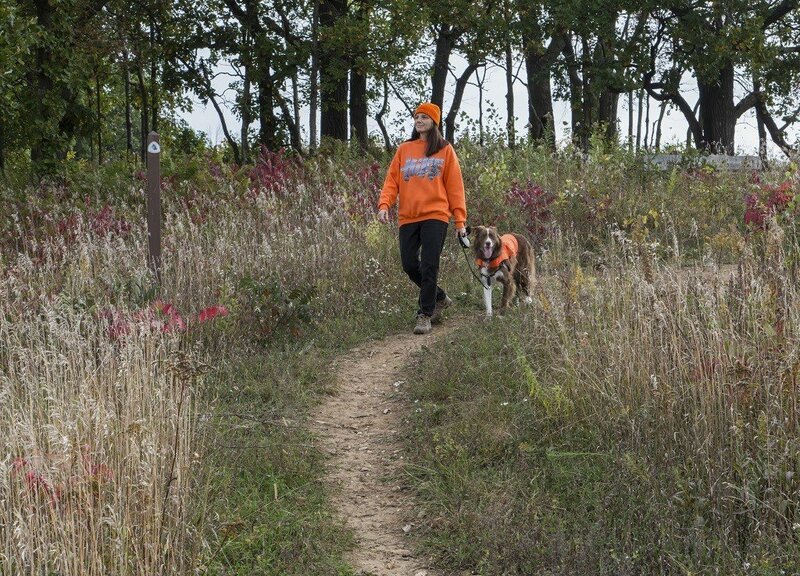 We consider October through April as Blaze Orange Season on the Trail. THE TRAIL CLOSES IN SOME AREAS WHERE IT CROSSES PRIVATE PROPERTY. The Trail Conditions page has information on sections that close, but it may not have all of them. Many of our volunteer chapter coordinators know the parts of the Trail that close in their region; contact the coordinator in the area you want to hike to find out about Trail closures. Sections that close should also have on-the-ground signage announcing the details of the closure. THE 9-DAY GUN DEER SEASON is from November 17-25, 2018. This is the most popular season and the time you’re most likely to see your hiking options limited. The Hunting Season Schedule is available from the Wisconsin Department of Natural Resources. This entry was posted in Uncategorized and tagged Blaze orange, Hike, Hiking, Hunting Season. Bookmark the permalink.